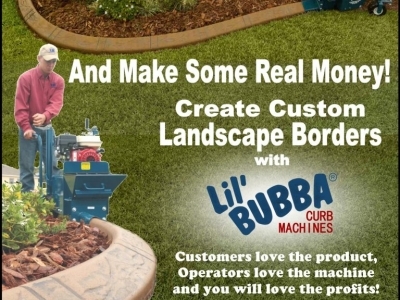 Lil Bubba builds the best Landscape Curbing machines available anywhere in the World. Made right here in USA these machines are now in use on every continent producing miles of decorative landscape every day. The machine can be purchased with a trailer and all the other equipment required to operate a high profit home based business. The curbing business is very lucrative, requiring minimal investment to start and returning a six figure income for many entrepreneurs. The business requires no special skills and a new start up can be profitable in its first week. If you are looking for the best curbing machine, then you will want our Lil' Bubba© EP Curbing Machine! The patented plunger system makes the EP machine the unchallenged "Cadillac" of the Concrete Curbing industry and a natural addition to many existing businesses such as General Contractors, builders and landscapers. The unique design of our plunger system makes the EP simply faster, more user friendly and far more efficient. We have a variety of packages which combine the Lil Bubba with all the basics you will need to go lay some curb. Each package has a custom trailer capable of transporting the sand and cement and equipment to the jobsite. Included is your training class in Orlando FL where you will learn the operation of the machinery, the finishing of the curbs and even how to easily market and sell your product. No experience is necessary and the you can begin your new business and forge the freedom it provides very quickly. A recent study has shown that the average Curber is producing sufficient product to earn up $1,500 or more per day. With material costs low the profit potential is impressive with average gross revenue of $5,000 - $7,500 per week - anyone who has a good work ethic has the potential to do really well! Our Customer Service is without equal. Technical Support is available 24 hours a day, seven days a week - and we will respond to your questions with detailed responses, based on our more than 75 combined years of experience! Our Team BELIEVES that the Customer comes first - and everything that we do is geared toward that belief. We work extensively to ensure that our packages are as comprehensive as possible – and they give you everything that you need to succeed in the Curbing Industry! Call us now! I believe this is a good opportunity. Type of Business Comments: Dealership and Licensor business. Support Comments: Office support to get your business launched and successfull. Additional Listing Comments: This one’s for the entrepreneur. For those who believe that sweat is liquid victory. That calluses are trophies. And that there’s nothing more terrifying than a cubical. We get it. That’s why we made Lil’ Bubba—a concrete curbing side kick that gives you industry leading capabilities and sweet independence.